Maternal depression robs mother's enthusiasm, energy, and motivation for parenting. This disrupts parent-child bonding and has negative effects on child’s growth, development and social well-being that can lead into adulthood. Depression is common among parents: Share your parenting tips. Depressed mothers suffer from prolonged sadness and despair. They get less sensitive towards the needs of their children; even during their tender years of growth and development: infancy and toddler years. Disturbed parents are unable to play with and talk to their children as would be desired in stimulating and proactive parenting. The developmental milestones and psycho-social maturation of children nurtured by depressed parents fails to achieve optimal levels. Chronically depressed mood, inadequate sleep, low energy and feelings of hopelessness are the symptoms that are usually found in depressed mothers. This often leads to ineffective and/or improper parenting. With the result, depressed mothers provide less supportive and limit setting discipline than the non depressed mothers. The depression can present in either parent, but statistics show that the mothers are especially vulnerable. Over one-third of women during their childbearing years have at least one episode of clinical depression - A time when they are most needed by their children. I in 10 fathers are reported to suffer from postpartum depression, which is more than twice as common than in the general adult male population. Teenage mother is “kid having a kid”. Emotional maturity is essential for optimal parenting. Parenting is demanding; both physically and emotionally. A father's involvement throughout his child's life is important. Disharmony between the parents and/or other family members. History of prior depressive episodes in the mother. Separation or loss of a parent. Financial crisis in the family. Low understanding capabilities, often due to poor educational background. Postpartum maternal depression is seen in 25 to 50 percent of all women during the first 3 months after the child birth. Read more on "Baby Blues" and "Postpartum Psychosis" under Parenting newborns. Parenting with maternal depression is incredibly challenging and stressful task. Disturbed parents miss on fulfilling experiences of parenthood, and are unable to have happy interactive relationship with their children. Environment needed for social, emotional and physical well-being of parents and children is not established. Mother's depression is an issue that affects an entire family. 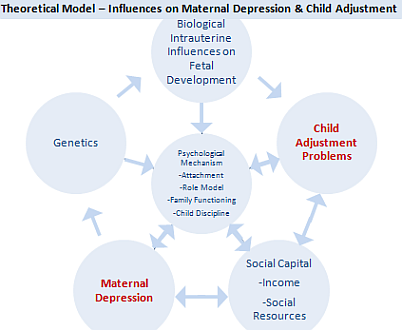 Parental deprivation attributed to parental depression hampers over all childhood development. Effects of depression in parents can be more serious and debilitating on the children in event of associated financial strains and high levels of stressful life events. Children during infancy, toddlerhood and the preschool years are most vulnerable to the impact of maternal depression than school-age children or adolescents. Traumatized children's personality development gets masked by the overwhelming sense of fear and helplessness. Children commonly experience trauma due to strict disciplining by disturbed parents. 2. May even be the underlying cause of childhood psychiatric disorders. Have difficulty controlling anger and aggression. Poor development of self-regulation. Read more on self regulation under "Psycho-social Development of Middle Childhood"
Difficulty in making friends & getting along with peer group. 1.) Infants of depressed mothers are withdrawn. 2.) Usually they are irritable, difficult to soothe, and generally unhappy. 3.) They often learn from their early experiences that only negative strategies, such as fussing or crying, will elicit a caregiver response, which then becomes the child’s standard approach. Positive parenting skills and support from family members often help parents through the stressful situations arising during child-rearing years: The most common cause of depression in parents. Post your parenting tips. Related pages are tabulated on the right column.